The foreground view of the Continental Bridge and Dallas' modern Margaret Hunt Hill Bridge behind it. 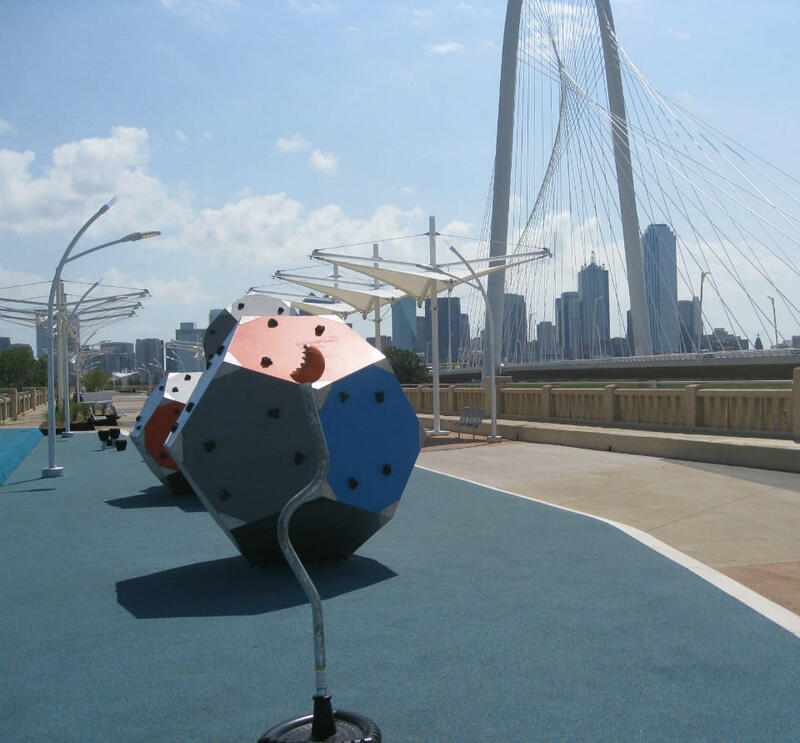 The Continental Bridge Park officially opens Sunday. Rick Davis says there’s no question about the demand for this 1930s bridge that has been converted for walkers and cyclists. He’s seen a few people trekking from Riverfront to Trinity Groves already. 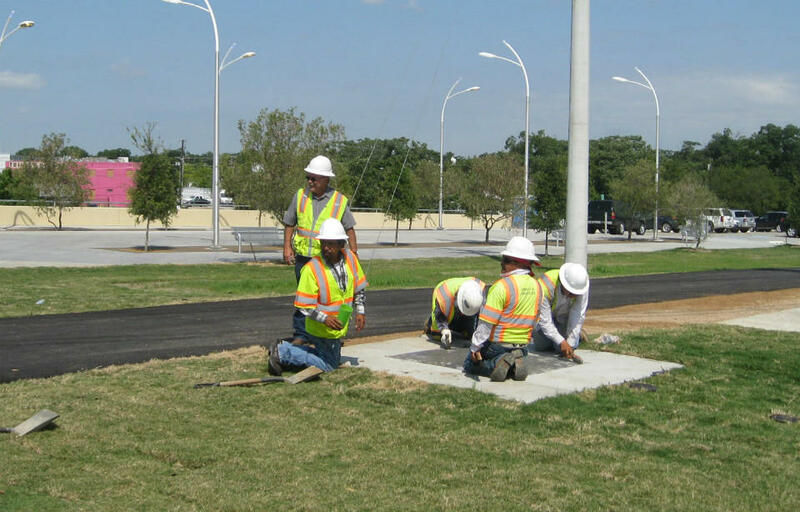 Construction superintendent Rick Davis (standing) with members of his crew on the Friday before Sunday's official opening of the pedestrian bridge. Davis would know. He’s the construction superintendent who’s been up here for months as crews drilled new shafts, then transferred loads from weak, old columns to strong, new ones. 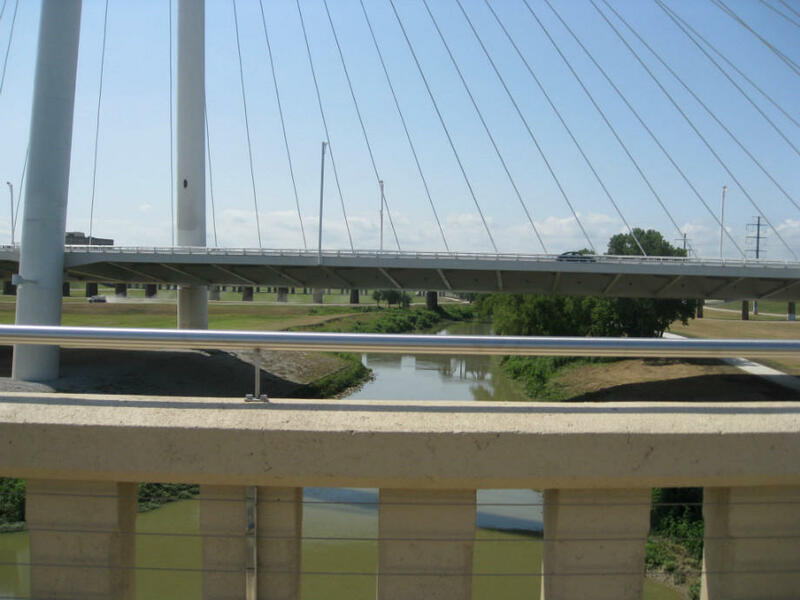 The 1,900-foot bridge from levee to levee boasts a lot more than a walkway, says Shawn Williams, with the city of Dallas. 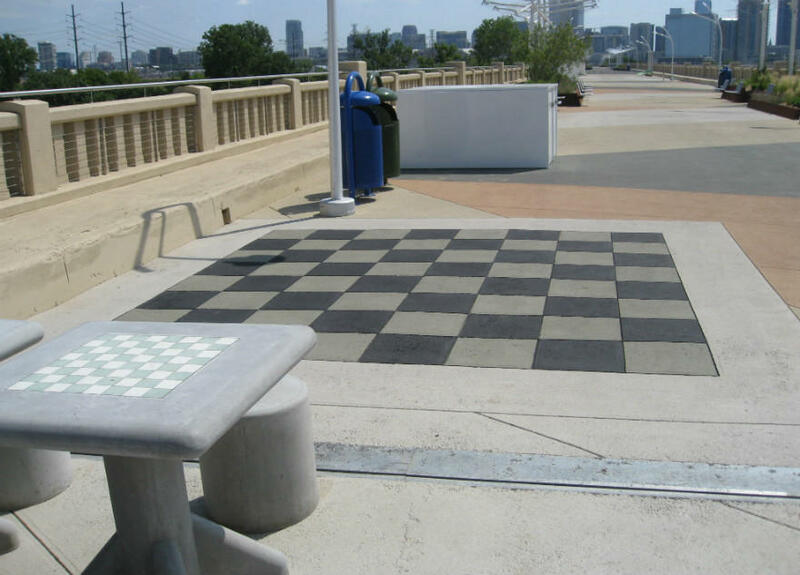 Sit-down chess boards next to the human-size board for fun and variety on the Continental Bridge. There’s also a playground with colorful, geometric climbing blocks on a safe, soft surface. Lounge chairs line up near rows of built-in metal seats. Spans of tall, white cloth block the sun and others, of rope mesh, will shade visitors when vines grow and curl over them. Playground of climbing blocks on squishy soft surface. It’s also a scenic extension of the city’s hike and bike trails, thanks to the 2012 bond package. Trinity River as seen from the Continental pedestrian bridge as it also runs under the Margaret Hunt Hill Bridge. On Sunday special events run throughout the day. A 5k run kicks off at 7 a.m.; there’s a gospel brunch requiring tickets; vintage cars; an exhibit of old doors transformed by area artists; and a 1930s dance-a-thon and speakeasy at night, honoring the year the viaduct was born.